This is another extraordinary opportunity to be a part of a second group of people committed to exploring how, by following a very specific set of agreements and procedures, we can experience the emergence of wisdom amongst us. The group will work with the book THE POWER OF COLLECTIVE WISDOM* which brings together extensive research about enlightened group process as a way of addressing the pressing need for finding better ways for groups of people to work together in the common interest. PLEASE NOTE: We believe, to get the most out of these sessions, it is best for people to commit to the whole series. The group is limited to 10 participants. Participants are encouraged to get their own copy of the book – however, handouts will be provided. WHERE: In Victoria at – the upper lounge at the BCGEU Building, 2994, Douglas Street. In Sooke at – Unit 69 – 5838 Blythwood Road (Lannon Creek Park). Payment by cheque or cash can be made on the first evening of the group. Cheques to be made out to “Centre for Earth and Spirit”. 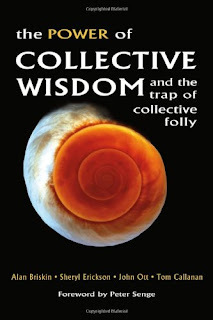 * THE POWER OF COLLECTIVE WISDOM – by Alan Briskin, Sheryl Erickson, John Ott, and Tom Callanan (Berrett Koehler Publishers Inc., San Francisco, CA. 2009). REGISTRATION is required for this group because of the limited space. Michael Tacon is a retired psychotherapist who has been active in offering programs under the auspices of the Well Foundation in Victoria since 1999 and more recently with the Centre for Earth and Spirit. He has worked extensively with a wide variety of groups since the 1960’s. Michael is excited about exploring the potential for generating collective wisdom as a resource for tackling some of the daunting issues facing our society at this time. For example, he is wondering if a collective wisdom group could act as an advisory resource for the recently formed Sooke Transition Town Society and other similar groups looking to facilitate meaningful change in our communities. Janet Pivnick has worked and studied in the environmental field for the past 30 years. She has been involved with environmental organizations across Canada and the United States and was the Director of an environmental education consulting company, Earth Wise, in Calgary for 15 years. For centuries, the Elders were the wisdom keepers of the community. Today, more than ever, we need women and men of depth and experience to offer their unique perspective and contribution to society. This weekend experience can open the door for you to explore new possibilities for your life as you approach retirement and leave the world of work. If you are already retired, this workshop can offer you a new model for living with meaning, purpose and significance in this stage of your life. How to approach retirement and your later years with confidence, enthusiasm and vision! A strong sense of meaning and purpose while harvesting the fruits of your working and family life! How to overcome the fear that is so often associated with aging and mortality! The company of other people who are seeking to embrace elderhood as a meaningful and dignified way of life that offers much richness and wisdom society, community and family! Feel more empowered and reassured as you consider a new model of living as an elder! What does elderhood mean in contemporary society? WHERE: Auditorium at the BCGEU Building, 2994, Douglas Street, Victoria. COST: $120. Limited scholarships available - please inquire by phoning Michael at 250-642-2517. Payment at the door on Friday. Make cheques out to "Centre for Earth and Spirit". PLEASE NOTE: You are advised to bring a bag lunch. Beverages and snacks will be provided. Also bring a blanket and something to write in such as a journal. Michael Tacon is a retired psychotherapist who has been active in offering programs under the auspices of the Well Foundation in Victoria since 1999 and more recently with the Centre for Earth and Spirit. Since 1998, he has been interested in new approaches to aging and in reframing and reviving the role of elders in the context of these challenging times. In 1999 he designed a one year program of 10 weekends called THE ELDER PROJECT in which a group of 10 men took part. Michael lives in Sooke with his wife, Beverley England. Have you ever felt that sometimes your life has been guided by an unseen hand? Have there been times when you knew with an inner certainty that you had made the right choice for you? In these uncertain times, we seek reassurance that our lives make some kind of sense. We want our participation in the great drama of life to be meaningful and significant so that we feel we are part of something greater than ourselves as individual human beings. This workshop offers a simple approach to discerning what our unique role and contribution in life could be, beyond merely taking care of our personal needs and making our way in the world. Using some basic meditative methods, the workshop takes you through a process aimed at opening you up to the intuitive resources which lie beyond thought. In this way, you have the possibility of connecting with elements of your personal destiny so that you can be the person you were meant to be. The invitation is to explore how we can relate to the future as co-creators rather than as victims of circumstances. WHERE: The upper lounge at the BCGEU Building, 2994, Douglas Street, Victoria. Payment by cash at the door or by cheque. Please make cheques out to "Centre for Earth and Spirit". Michael Tacon is a retired psychotherapist who has been active in promoting proactive responses to societal change through his work with the Well Foundation, the Centre for Earth and Spirit, the Pachamama Alliance and more recently with the Sooke Transition Town Society. He lives in Sooke with his wife Beverley. "This workshop is inspired by the book PRESENCE* written by Peter Senge and others which offers a compelling account of the "U Process", a method of letting go of habitual ways of seeing and acting in the world of human affairs so that it becomes possible to get in touch with what the unfolding future requires of us. I have always wondered how we can resolve the wide ranging and complex problems facing our society when Einstein has pointed out that we cannot adequately deal with these issues from the same mindset out of which they were created in the first place. I am convinced that we have to go beyond our reliance on mental processes alone. That is what I want to explore with you in this workshop. Please join us for this adventure". "AWAKENING THE DREAMER/CHANGING THE DREAM"
The Pachamama* vision is that North America and the West generally need to awaken from a false dream based on growth, individuality, and endless consumption and help to create a world that has environmental sustainability, social justice, and spiritual fulfillment as key values. NOTE: Please bring a bag lunch – beverages provided. Payable by cash or cheque on arrival on site. Cheques to be made out to "Center for Earth and Spirit". Price: $60 with local alcoholic beverages for sale (you get a charitable tax receipt for a portion of the ticket). All proceeds will go to support LifeCycles and its programs. Tickets available online at http://lifecyclesproject.ca/ or for purchase at LifeCycles, 2-625 Hillside Avenue and Good Planet Co., 764 Fort Street. Make cheques payable to LifeCycles Project Society. Can’t make the event? 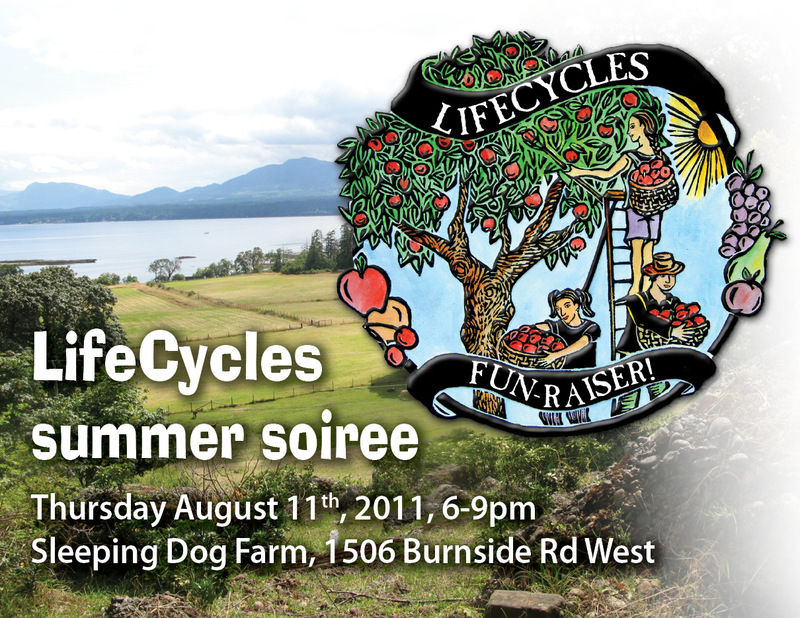 Consider making a donation, or buying a ticket for one of the LifeCycle volunteers! · The Fruit Tree Project harvested 30,000 lbs or fruit last year and produced delicious pear brandy, apple cider vinegar, kickass plum chutney and quince paste. · Growing Schools has developed food producing gardens in 24 schools in this region. · Sharing Backyards has linked 27 people who want to garden and grow food with backyards that need care this year. · LifeCycles has joined together with Island food producers, NGOs and the five Island Campuses to support the Vancouver Island Local Food Project’s research and action project to increase local food security. 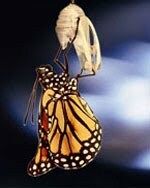 This is a sample of the important and innovative projects LifeCycles coordinates. 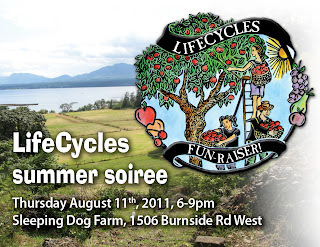 LifeCycles is an internationally – renowned Victoria-based community NGO founded in 1996. LifeCycles works to grow the local food system through schools and community gardens, the fruit tree project (which picks and redistributes tons of excess local food each year), through youth and community engagement and educational initiatives. In the past 17 years they have worked locally and globally with food producers and supporters and reached thousands of people. Thanks to event sponsors and supporters! The conclusion of our series will be a chance for presenters and participants to gather in conversation about the rich wisdom that we have shared over the past several weeks. Again we will encourage a participatory evening bringing together and sharing our insights and understandings of the topics that we have brought forward in shared conversations over the past 7 weeks. Be part of the conversation and the learning community. What does it mean to be an "Elder" in a healthy/emergent earth community? As never before, our society needs the active presence of mature, experienced and committed men and woman to serve their communities in these times of change. We’ll explore together what qualities make effective guides and mentors to midwife the emergence of a new relationship between the humans and our planet. COST: $20 or a donation - at the door. PLEASE REGISTER: Space in the BCGEU lounge is limited to 25 people. We'll introduce the use of a circle for deepening community processes and share Bill Plotkin’s Eco Soul Centric Human Development Wheel. We'll use the wheel as an example of how practices and rituals can personally and collectively assist us into tapping into our deep stories as well as be a guide for returning to an earth centered existence. Come prepared to share and return to the circle. In this ongoing weekly series of interactive sessions we continue to explore how shifting views of the universe can help us to see our relationship with the Earth in new ways. We invite you to join us in considering our role as “change agents” and the profound and exciting implications for all sectors of society. As we face increasingly complex challenges, the human role is shifting from individual ingenuity towards collective wisdom and innovation. We will review the features that make collective collaboration more likely to succeed and examine the trap of collective folly. This evening is based on the book, The Power of Collective Wisdom.